© Copyright 1990/2006 by Timothy Conway, Ph.D.
At this website on Christianity, I give an overview of 2,000 years of Christian history, with emphasis on Jesus and the great saints and sages of Christendom East and West. This is followed by a list of key vocabulary terms, then by a list of important books on "The Historical Jesus" and on Christian mysticism. Next comes a roster of important dates in the history of Christianity. Finally, mention of important places/pilgrimage sites in Christendom, and a brief mention of important Catholic orders and Protestant denominations. Christianity is the largest religion on the planet, the religion of almost one-third of humanity, that is, slightly over 2.1 billion souls, inhabiting every continent on earth. One of the most significant aspects of this dominant faith is that no other major world religion, even Buddhism, focuses so strongly upon its founder as does Christianity in its emphasis on the life, death and resurrection of Yeshua, better known by the Greek version of his Aramaic name: Jesus. Yeshua or Jesus has a special status in traditional Christianity as the redeemer of fallen humanity. He is viewed as the Christ (Gk: Kristos, from the Hebrew Masiah / "Messiah," "the Annointed One"), the Second Divine Person of a Trinity, the Eternal Logos, "begotten, not made, one in substance with the Father; through Him all things were made." An elaborate orthodox theological view of Jesus' nature was gradually drawn up, in an extended 500-year-long process marked increasingly by bitterly conflicting views and vehement arguments, and then set in stone by the Church patriarchs. The watershed points were a bishops' Council at Nicaea in 325, and the Council at Chalcedon in 451, in which Jesus was declared to be fully God and fully man, the only begotten Son of God, born of the ever-virgin Mary, etc. The dogma on whether Jesus was Divine or human would be temporarily reversed and then reversed again depending on who was emperor in the 4th-5th centuries. But for the last fifteen centuries the concept of Jesus as Divine Person of a Trinity has remained intact in Christendom. (Islam, by contrast, did not view Jesus as Divine, but as a very holy prophet, like Muhammad, Elijah, Moses, and all other prophets sent by God). 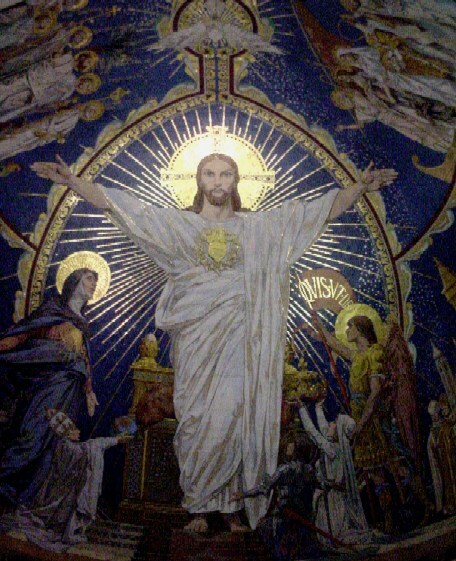 This special status of Jesus has been an inspiration to countless Christians, but has served to alienate them from other religions, or from other interpretations of Christianity that do not put Jesus onto such a rarified pedestal but prefer all emphasis be on God the Father or the Godhead. David Friedrich Strauss of Tubingen University, Germany, in 1835-6 published his 2-volume The Life of Jesus Critically Examined, which exposed many of the internal inconsistencies in the four canonical gospel accounts. Subsequent research by scholars of the Tübingen school, and by Rudolf Bultmann and disciples of Marburg University (with his "form criticism" method of literary analysis) ushered in the age of modern New Testament scholarship, which has "demythologized" the person of Jesus and painted a very different portrait of him, an obviously much more secular view of Yeshua, than one finds in mainstream Christianity. These scholars have sorted through the documents of the New Testament—the earliest virtually complete texts of which are the Greek documents, Codex Vaticanus and Codex Sinaiticus, dating from the early 4th century. 1) Paul's epistles/ letters are the earliest Christian writings (circa 50 CE) known to us, though they were not brought together into a single collection until the early 90s of the first century CE. 2) Not all of these Pauline letters were indeed written by him—a number of epistles, such as Colossians, Ephesians, Titus, I Timothy, II Timothy, and sections of the earlier epistles, are judged to have been written by later writers seeking to add more prestige to their arguments by using Paul's name. Moreover, even the "authentic" Pauline works have a number of interpolations inserted into them by later scribes. During his own lifetime, Paul was complaining about forgeries being created in his name. 3) Of the three “synoptic gospels”—Mark, Matthew and Luke (called synoptic, “same-eyed,” because they share so much common material), the Gospel of Mark is probably the earliest (circa 70 CE) and least characterized by later “high Christological” ideas, followed by the gospels of Luke and Matthew (composed circa 70-85 CE). 5) The Gospel of John was the last to be written, c.100 CE, yet parts of the narrative element of John (the so-called “Signs Gospel”) may be very early, perhaps written around 50 CE. Some scholars have argued that the Johannine Gospel possesses the most authentically Aramaic flavor behind the Greek words (Aramaic, not Greek, was the primary language of Jesus and his apostles). Most scholars (and anyone else who reads objectively) do not see the New Testament works as “infallible” and “of divine authorship,” but as mutually conflicting on many important points, especially with regard to the sayings, doings, trial, resurrection, and very nature of Jesus. The bulk of the gospels are re-workings of original material in oral and text form by later Christians who had a more-or-less different agenda than the first generation of writers- transmitters. So, for instance, some modern investigation has focused on a key text, the Gospel of Thomas, which only emerged in its entirety to scholars in the 1950s after its discovery by a peasant at Nag Hammadi, Egypt, in 1945. This Thomas Gospel, a “sayings-only” text, has been shown by Stevan Davies et al. to contain probably authentic early teachings of Jesus, predating the synoptics. (E.g., the Mark Gospel and the Thomas Gospel share some Jesus teachings in common, but the Markan versions of these teachings appear derivative from and later than Thomas, and re-worked into narrative "frame stories" to make a point foreign to the original Thomasine context of the sayings.) Many of the Thomas Gospel sayings are anti-apocalyptic and deeply mystical, pointing to an innate Divine Reality in everyone, not just in Jesus. Some scholars now realize that the Gospel of John was composed around the end of the 1st century to oppose and replace the “Thomasine” Christian view with a dogma focused on Jesus’ exclusive divinity. In any case, the existence of the Gospel of Thomas is clear evidence of another group of early Jesus-followers, a "Thomasine community," that had their own sense of what it meant to be a disciple of Yeshua. At this additional website on the Teachings of Jesus one can read many passages from all these six sources of Jesus material (the Gospel of Thomas, the reconstructed Q-text, and teachings from the four canonical gospels). The bottom line: a serious crisis afflicts Christianity. The vast majority of Christians hold a view about Jesus which the majority of Bible scholars do not accept as being what Jesus thought of himself. These scholars think Jesus was (and saw himself as) a deeply pious and mystical Jewish man, a healer and teacher or rabbi, an emissary of God’s Wisdom (Heb: Hokmah / Gk: Sophia) with an eschatalogical or “last days” role of ushering in God’s domain with his own earthly ministry. The view of the majority of Bible scholars is that Yeshua never intended to establish a new, non-Jewish religion, but simply wished to reform the religion of his birth, to transform it into a vehicle for true worship of Abba, our loving Divine Father, who, in Yeshua's view, often behaves like a very merciful Mother (see, for instance, Yeshua's famous parable of the prodigal son returning home). Yeshua defied many of the tabus of his day, such as associating with women, "publicans and sinners," the sick, and other people marginalized by an interpretation of Jewish law that had in certain respects grown excessively rigid and severe. With regard to women, it is now clear from study of passages such as Luke 8:2 and Matt. 27:55-6 that Yeshua had at least 6 to 8 close female disciples, in addition to "the Twelve" male disciples. 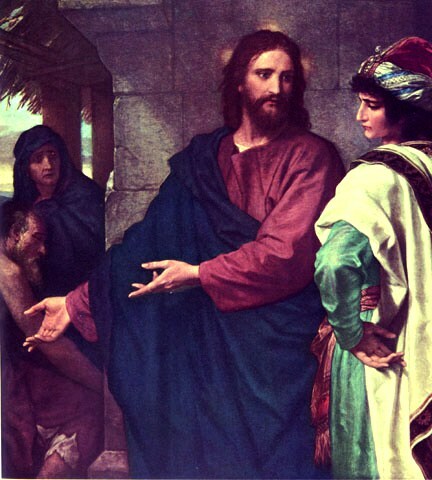 Mary of Magdala (not a prostitute, contrary to the popular legend) may in fact have been one of the closest, if not the closest disciple to Yeshua, according to feminist scholars Elizabeth Fiorenza, Elaine Pagels, et al. Most scholars have rejected the claim that Yeshua physically resurrected himself from the dead, and the skeptical scholars claim that the disciples' postmortem experiences of Yeshua were mere hallucinations. Yet female and male apostles who experienced Yeshua's postmortem presence were very likely enjoying palpable visions of his subtle-energy body, which can sometimes have palpable physical characteristics, in the same manner that disciples of a number of great spiritual adepts East and West have also experienced the postmortem, tangible presence of their physically departed master when he/she chooses to visit them from the planes of “subtle light” (e.g., the cases of Tibet's great Buddhist yogi-saint, Milarepa, d. 1135, or Shirdi Sai Baba of India, d. 1918). The gospel accounts themselves conflict so much with each other about the events after Yeshua's death that they simply cannot be seen as reliable "reporting." This author holds, on the basis of his research into the cases of hundreds of great adepts throughout the world, ancient and contemporary, that Yeshua became so God-absorbed, so pure in heart and focused in mind, that he underwent that "quantum jump" of radical transformation; he became a fully awake being, no longer caught in the egocentric dream of "me and my," completely liberated from the attachments, fears, and delusions of "normal" men and women. Thus free of all usual human taints, and perfectly identified with Absolute Spirit or Awareness, Yeshua became strongly available as a conduit for Divine blessing force to anyone who calls on him. In this sense, one may speak of Yeshua as being one with God, the Supreme Awareness-Intelligence-Aliveness-Majesty-Goodness. As is said in the ancient Brahma Sutras of India, having known the Brahman (Absolute Reality), he has become Brahman. So the soul of Yeshua, one with the Spirit of God, would be a living presence after his physical passing and continue to be so these last 2,000 years, appearing in subtle-form to devotees. How Yeshua passed from this earth is debatable, but most surely it was not a bodily flight beyond the upper atmosphere and then to another region of the physical cosmos! After his passing beyond the world, many of his disciples are said to have experienced a deep spiritual empowerment, commemorated as the Christian feast of the Pentecost. Scholar Stevan Davies, in another fine book, Jesus the Healer, based on cross-cultural anthropology studies, concludes that this was a group form of spirit-possession, stemming from Jesus’ own experience of Spirit-possession and ability to induce a spirit-possessed, altered state of consciousness in his disciples. This spirit-empowering Jesus cultus quickly began to win converts, not only in the area of Palestine, but throughout the Hellenistic world. Two factions soon developed among the leaders of these Nazarenes—in the one camp, those who tried to preserve its intrinsic Jewishness and, in the other camp, those who opened up the new faith to include Gentile members and make use of Hellenistic ideas and practices (filled with "pagan," i.e., agrarian religious themes and tropes). James, the biological brother of Yeshua (Yeshua had four younger brothers and at least two younger sisters, say the Gospels), would have been the leader of the pro-Jewish group of Nazarenes at Jerusalem. This is Ebionite Christianity, which survived for several hundred years before dying out—see the extensive work of Robert Eisenman. The fervent new convert, Paul (formerly Saul, a Jewish rabbi and merciless opponent and executioner of the Nazarenes), who never even met the physically-embodied Yeshua, but had some kind of numinous experience of the Master after his death, helped spread the Nazarene cult throughout the Mediterranean world, along with people like the author of the Gospel of John. These two early Christian missionaries (Paul and the John Gospel author) assimilated many Greco-Roman pagan elements into their Pauline-Johannine version of Christianity. When the Romans crushed the Jewish rebellion in 70 CE, and destroyed the Temple at Jerusalem, the factional battle in Christianity was decided in favor of paganized or Hellenized, Pauline-Johannine version. This faction distanced itself even further from its own original Jewishness and became decidedly pro-Roman and anti-Semitic. While Church fathers Irenaeus (d. c.200), Tertullian (d. c.220), Clement of Alexandria (d. c.220) and Origen (d. c.254) in the early period and Cyril and Augustine (5th century) of a later period tried to prevent Christianity from becoming just another of the pagan Mediterranean mystery school religions, more and more Greco-Roman pagan ideas and practices, especially from the widespread cult of Mithras, were in fact being assimilated into Christianity, by these very thinkers and others. Thus Yeshua (now known by the Greek version of his name, "Jesus") was "hyped" into becoming a Divine figure akin to the Greek heroes Heracles, Asclepius, and Dionysius, and pagan gods Osiris and Mithras. Scholar Gregory Riley has shown how Hellenistic culture’s “Four Classes of Beings”— humans, heroes, daimones and gods—led to Jesus being turned into a blend of courageously dying-resurrected hero and then a god among gods, and finally the God-man par excellence. It was this dynamic which led to Christianity spreading wildly, like an "invasion," said Pliny the Younger to emperor Trajan in 110. Christians bravely maintained their own identity against waves of persecution by certain Roman authorities alarmed by the spread of this cult which did not honor the other Hellenistic divinities and was luring so many converts out of the pagan temples. The 3rd century in particular witnessed the brutal execution of several thousand Christian martyrs, who willingly died for their faith rather than renounce it. Then the great reversal occurred when Constantine became Roman emperor in 317 and made Christianity the official state religion. In this way, a cult that was marginal and "new age" in the Greco-Roman world became the official faith of the land, and rival religions—the Divine Mother cults to Isis, et al., Mithraism, neo-Platonism, and other religions—were all persecuted by the Christians and suppressed into virtual oblivion. It is clear to New Testament scholars that Episcopal Christianity invented the story of Jesus ordaining male priests and handing the "keys of the kingdom" to Peter, so as to justify their lineage as the true version of Christianity. More egalitarian, charismatic, mystical forms of Christianity, or those which did not view Jesus as the only Son of God, Second Divine Person of the Trinity, were heavily persecuted. Nevertheless, victorious Christianity saw itself as "catholic," universal, in that Jesus was held to have died so as to redeem the sins of all humanity. Koine Greek, the universal literary language of the empire, was the language of Christian scriptures. (Aramaic was the main language of Yeshua—he probably also spoke a little Greek and understood biblical Hebrew.) Leading Christian thinkers now participated in the spirit of Greco-Roman (pagan) Hellenism. Monastic Christianity was developed further by such leading lights in the East as Gregory of Nyssa (330-95), his brother Basil (330-79) and their sister, Macrina the Younger (actual founder of Eastern monasticism), and, in the West, Martin of Tours (315-97; bishop, missionary, wonderworker, and father of monasticism in France), John Cassian (360-435), and Benedict of Nursia (480-547; the moderate, mystical father of monasticism in Italy). The monasteries yielded some of the finest fruit of Christendom. Benedictine abbeys became the grand centers for learning and culture during Europe’s Dark Ages. Many saintly abbots/abbesses headed these institutions over the centuries. Most significant was the Cistercian reform led by Bernard (1090-1153), et al. (Bernard also was the main promoter of the cult of Mother Mary in the West). A strong tradition of via negativa or apophatic mysticism, realizing God/Spirit prior to all images, forms and concepts, took off with pseudo-Dionysius (Denys) Areopagite, an unknown monk (likely Syrian) who, circa 500 CE, wrote seminal works of mystical theology and transcendental metaphysics synthesizing Christianity and Neoplatonism (Plotinus, Proclus, et al.) (see Dionysius’ Divine Names, Mystical Theology, and epistles; he also wrote some via positiva works: Celestial Hierarchy, Ecclesiastical Hierarchy). The next great proponent of mysticism—combining the apophatic via negativa with a very positive sense of the final "cloud-like," "sightless" beatitude in/as the Divine—was John Scotus Eriugena (c.800-c.877), “the greatest Christian mind of the early middle ages,” a towering theologian. This Irishman heading the Palatine Academy in France, founded by Emperor Charlemagne (742-814) to renew theology, has long been neglected by most of Christianity, but recent scholarship is restoring Eriugena to eminent status. Retrieving the best ideas of the Greek Fathers, he gave European Christianity a profoundly nondual and quite rich theology of panentheism (no mere pantheism or limited theism) and he retrieved the beautiful early Christian emphasis on apocatastasis, or, as Eriugena terms it, the reditus or return of all beings into/as God. His profound theology was subsequently known and appreciated by only a few Christians of the middle ages, like Meister Eckhart, but Eckhart and followers kept alive this profound Christian mystical view and inclusive spirit of love. Both traditions have hosted wonderfully holy saints over the centuries down to the present, esteemed for their sheer goodness, purity of heart and humility, miracles, service to the needy, wise counsels, and, in certain cases, theological contributions and/or establishment of new religious orders, foundations and missions. The roster of pious folk celebrated by these traditions over the last millennium numbers well over 10,000 souls, far too many to be listed here (Alban Butler's Lives of Saints is the classic reference work on saints in the western, Catholic tradition up to the 19th century, but even that multi-volume work isn’t comprehensive; see Ann Ball's two-volume Modern Saints for dozens of saints of the late 19th and 20th centuries not included in Butler). Here we quickly name a few of the most illustrious, in addition to those earlier mentioned. In the Eastern Orthodox tradition, we have the early "Great Doctors of the [Eastern] Church" (Athanasius, the aforementioned Gregory, Basil, John Chrysostom, and Gregory of Nanzianzus); Simeon the New Theologian (949-1022); Gregory Palamas (1296-1359; a major exponent of hesychasm); Sergius of Radonezh (d. 1392; Russia's first authentic mystic); Tychon of Zadonsk (1724-83); Paisy Velichkovsky (1722-94; he traveled to Mt. Athos, Greece, and brought back to Russia a renewed eremitic lifestyle); Amvrosy of Optino (1812-91; a renowned healer and leader of the Optino monastic community near Kozelsk, inspired by Velichkovsky); Seraphim of Sarov (1759-1833; an ascetic wonder-worker and by far the most beloved staretz/saintly elder in Russia); John Sergieff of Kronstadt (1829-1908, a secular, married priest, a non-ascetic teacher of prayer, famous as a thaumaturge); three of the many “holy fools” for Christ—Xenia of St. Petersburg (18th c.), Pelagia Ivanovna Serebrenikova (1809-94), and the latter's successor at the convent of Divyevyo founded by Seraphim of Sarov, Pasha the Holy Fool (1795-1915); three modern-day miracle-working saints of Greece—Arsenios of Paros (1800-77), Methodia of Kimolos (1865-1908), and Savvas of Kalymnos (1862-1948); and John Maxomovitch (1896-1966; settled in San Francisco, a miracle-working theologian, ascetic, servant of the poor, and Orthodoxy's reputed holiest man of the 20th century). In the West, with even more saints celebrated than in the East, Augustine, Ambrose, Jerome and Gregory the Great are honored as the four early "Great Doctors of the [Western] Church"; Nicholas of Tolentino (4th century; a highly popular bishop and miracle-worker whose life became the basis for the "Santa Claus" legend); Patrick of Ireland (385-460; first missionary beyond the Roman Ecumene; his saintly power spread a non-Roman Christianity widely among the Irish); and Brigid (450-523; head of Ireland's first abbey and co-patron saint of that country); Cuthbert of England (634-687; miracle worker and beloved missionary of England); Etheldreda of Ely (630-79; the most revered of all Anglo-Saxon women saints); Hildegard of Bingen, Germany (1098-1179, abbess, visionary, writer, naturalist, artist); Francis of Assisi (1181-1226; the prayerful, humble founder of the Franciscan Friars, devoted to "Lady Poverty"; Francis is probably the most beloved popular saint of all western Christendom); Clare of Assisi (1194-1253; Francis' leading female colleague, head of the Poor Clare nuns); Dominic (1170-1221; the compassionate founder of the Order of Preachers, or Dominicans); Albertus Magnus (1206-80; masterful polymath wizard and teacher on many subjects at Cologne University); his disciple Thomas Aguinas (1225-74; the major scholastic theologian of all time, although his own mysticism led him late in life to dismiss all his acclaimed theological, intellectual writings as "so much straw"); Meister Eckhart (1260-1328; tried for heresy but one of the sublimest contemplatives and wisest Zen-like mystics in the history of the church); his disciple Johanne Tauler (1300-61; another eminent contemplative of Rhineland school, and did much service to the sick); John of Ruysbroeck (1293-1381; most important of the Flemish mystic-contemplatives); Catherine of Siena (1347-80; an ecstatic spiritual prodigy as a child, who went on to be honored as a Doctor of the Church); Juliana of Norwich (14th century holy anchorite and receiver of the joyous Revelations about God's all-forgiving grace); Francis of Paola (1416-1507; miracle worker par excellence, founder of Friars Minim, and advisor to seven Popes and five kings); Ignatius Loyola (1491-1556; the Spanish founder of the Jesuits); Teresa of Avila (1515-82; foundress of the discalced Carmelites, author of mystical works, wonderworker, and honored as a Doctor of the Church) and John of the Cross (1542-91; co-founder of discalced Carmelites and Mystical Doctor of the Church, par excellence; author of many important contemplative works); the "holy fool" Philip Neri of Rome (1515-95; a major positive influence on the city and the Vatican); Joseph of Copertino (1603-63; the ecstatic "flying saint"); Francis de Sales (1567-1622; beloved preacher and influential author); Vincent de Paul (1580-1660; great servant of the poor and co-founder, with Louise de Marillac, 1591-1660, of the Daughters/Sisters of Charity, first of the orders of women religious to successfully remain uncloistered and active in social service); the "Jansenist" spiritual directors Miguel Molinos of Spain (1627/8-97) and Jeanne-Marie Guyon (1648-1717) of France; John Baptist Vianney, the Cure of Ars (1786-1859; a simple French parish priest, widely renowned for his various divine gifts); John Bosco (1815-88; miracle-working founder of Salesians); Paul of Moll, Belgium (1824-96; one of the most amazing healers in church history); the "Little Flower," Therese of Lisieux (1873-97; whose saintliness comes from her postmortem miracles and her doing "little things" for God); Sharbel of Mahkloof of Lebanon (1828-98; worker of many postmortem cures); Frances Cabrini (1850-1917; Italian emigrant to the U.S., where she founded dozens of convents, schools, hospitals and other charitable institutions); Brother Andre of Montreal (1845-1937); Pope John XXIII (d. 1963; convenor of the historic Vatican II Council which opened up the Roman Church to new inspiration); two miracle-working stigmatics of modern times, Therese Neumann of Germany (1898-1962; who refrained from eating or drinking anything her last 35 years) and Padre Pio of Italy (1887-1968); Dorothy Day of the U.S. (1897-1980; foundress of the Catholic Worker service organization in solidarity with the poor); and the renowned Nobel laureate and servant of the needy, Mother Teresa of Calcutta (1910-97), foundress of the Missionaries of Charity. The reader is strongly urged to peruse the biographical material about all these blessed souls and many other leading lights of Christianity. Their words and deeds can be a tremendous inspiration. Despite the presence of so many truly wonderful persons in Western Christendom, the fact remains that Roman Catholicism was being undermined by excessive institutionalization, ecclesiastic exploitation of the people, mediocrity, corruption, superstition and commercialization connected with the "cult of saints." Various humble, pious reformers such as the much-persecuted Cathari or Albigensians of the 11th-13th centuries, Peter Valdes (12th century, France), John Wycliffe (d. 1384), and the "proto-Protestant martyr," John Huss (d. 1415), had all tried to change Christianity through their devout works and inspired preaching, but were ultimately unable to transform the monolithic institution of the Roman Church. It was a German priest, Martin Luther (1483-1546), aided by the recent invention of the printing press in the West, who was able to effect the greatest change, launching the Protestant Reformation in the second decade of the 16th century. Other Protestant leaders helped spread the reform, including King Henry VIII (d. 1547) and his Anglican Church reform in England, and the more "radical" reformers, Huldreich Zwingli (1484-1531) in Zurich, John Calvin (1509-64) in Geneva, and John Knox (c.1513-1572) in Scotland; their work created the Reformed Church. Meanwhile, the Radical Protestantism/Anabaptist movement had arisen with even more extensive reforms, heir to the austere spirit of the Waldensians, Lollards, and Hussites in prior centuries. This movement gave rise to various pietist groups such as the Swiss Brethren, Hutterites, and Mennonites. Other major developments and/or splits in Protestant Christianity would create the Puritan, Quaker, Baptist, and Wesleyan/Methodist movements in England in the next two centuries. The various factions of the Protestant Reformation all promoted widespread reading of the scriptures in the vernacular languages (thus ending the monopoly by priests and bishops), promoted the doctrine of "faith, not works" as the main factor in Christian salvation, terminated the sale of "indulgences" and saintly relics, eradicated monasticism and the practice of celibacy among priests, and, most importantly, ceased to give any obedience to the Roman Vatican and emphasized an egalitarian "priesthood of all believers." A number of brave Protestant men and women suffered intense persecution and even martyrdom as a cost for adhering to their new interpretation of the faith, at the hands of pro-Roman monarchs and bishops. In turn, a number of Catholics would suffer through the centuries in regions that became predominantly Protestant, Masonic or secular-humanistic, such as during the French Revolution and in the "anti-papist" U.S. and Mexico. It should be noted that early Protestantism did not improve the status of women, and, indeed, by taking away a woman's monastic vocation, women became even more exclusively the "property" of men. In later centuries, some Protestant women would begin to come to the fore, especially in the "Alternative" or "Third Way" Christian sects—e.g., the many women of George Fox's (1624-91) Society of Friends/Quakers, and Mother Ann Lee's (1736-84) charismatic Shaker community. Various Protestant denominations, such as the Quakers, Shakers, and Unitarians/Universalists would take the lead in allowing women to preach (originally forbidden by a pseudo-Pauline verse in Corinthians and Letter to Timothy) and then become ministers. In the last several decades, mainstream Protestant churches have begun formally ordaining women as priests and as bishops. Mainstream Protestantism as a whole hasn’t valued mysticism, transformation of consciousness, or deep contemplative prayer, and so has not produced more than a handful of the kind of charismatic spiritual adepts that one finds in the Catholic and Orthodox Christian traditions, or in Buddhism, Hinduism, Sufism, Taoism, Hasidim and shamanic traditions. The simple mystic cobbler of Lutheran Germany, Jacob Böhme (1575-1624), is one of the notable exceptions. The best lights of Protestantism have been the many humble souls doing service to the poor and spreading the love of Jesus through their own self-effacing example. Such people are numerous indeed, and include many women, like Hannah More (1745-1833), Sarah Martin (1791-1843), Florence Nightingale (1820-1910), Catherine Marsh (1818-1912), Clara Barton (1821-1912), Ida Scudder (1870-1960), Mary McLeod Bethune (1875-1955), et al. For an experience of ecstatic, mystic awareness in Protestantism, one has to explore the non-mainstream movements, such as 1) the Holiness tradition beginning in the mid-19th c., primarily an offshoot of Methodism (John Wesley, 1703-91, founder of Methodism, was himself a charismatic preacher, noted for promoting a kind of energetic trance state in his followers), and 2) the Pentecostal and neo-Pentecostal movements of the 20th century. Whereas all Protestant denominations emphasize the need for undergoing a basic conversion (metanoia), a turning toward God through the person of Jesus the Christ, the Holiness churches would invite a person to go a subsequent step, into real sanctification or purification of one's behavior; the Pentecostal churches would encourage a third step, full baptism into the charismatic power of the Holy Spirit (most Pentecostals would claim that the main criterion for this baptism of the Spirit is the ability to speak in tongues; many neo-Pentecostals de-emphasize this, along with toning down the emotional excess which is often characteristic of Pentecostal churches). Main figures in the Holiness movement have been Charles Finney, Pheobe Worrall Palmer (1807-74), Asa Mahan, Frances Willard (1839-98), William and Catherine Mumford Booth (1829-90), founders of the Salvation Army, Amanda Berry Smith (1837-1915), Sojourner Truth (1797-1883), and Alma Bridwell White (1862-1946), founder of the Pentecostal Union/Pillar of Fire Church, a Holiness denomination. Leaders of the Pentecostal movement include William Seymour, Billy Sunday, Demos Shakarian, C.H. Mason, Lizzie Woods, Ivan Q. Spencer, John Anderson, Aimee Semple McPherson (1890-1944), George Hawtin, Myrtle Beall, Oral Roberts, and the renowned minister of spiritual healing, Kathryn Kuhlman (1907-76). Neo-pentecostal leaders include David DuPlessis, Harold Bredesen, Howard Ervin, Alfred Price, Donald Gee, Dennis Bennett, Jean Stone, Larry Christenson, Ralph Wilkerson and Benny Hinn. A more “mainline” charismatic of great influence was Agnes Sanford. What is the state of Christianity at the turn of the 21st century? Some denominations are flourishing (Pentecostalism is the fastest-growing sect), others are fading. Some major ecumenical efforts to bring together certain denominations of Christianity have met with great success (e.g., with the Lutheran Church, the Disciples of Christ, etc.) while other attempts have shown little real progress (e.g., Roman Catholicism and Eastern Orthodoxy are particularly resistant to concessions in doctrine and practice.) A number of scholars are also working on ecumenical interfaith dialogues with Buddhists, Hindus, Muslims and Jews, becoming considerably enlightened in the process about the limitations of traditional Christian categories of thinking on the one hand, and, on the other hand, the exciting possibilities of cultivating Christianity within the context of other spiritualities like Vedanta Hinduism or Zen Buddhism—just as Christianity was initially cultivated beyond Jewish circles in Hellenistic Paganism. One thing is clear: multitudes of Christians are calling on God through the spirit of the holy rabbi, Yeshua, and experiencing that (as his very name suggests) God saves, God is a liberating Life and Power capable of setting men and women free from the prison of selfishness and misery. Christ--the "Anointed One," a Messianic title supposedly given to Jesus by his disciples, though many scholars studying the New Testament and early Christianity have doubted that the first generation of Jesus followers saw him in this light. Basileia Tou Theou-- “The Domain (or Reign/Rule/Kingdom) of God”; the main theme of Yeshua’s teaching. Bar enasha (Aramaic)--"Son of Man," a term which appears in the later layer of “Book of Q” teachings; Jesus allegedly used it in an offhand way to refer to himself; it has the connotation of "everyman," not necessarily intending a Christological/Messianic title, as implied in Daniel ch. 7. Logos--the "Word," Christ, the Divine Activity which creates, sustains and redeems humanity and the world; the word was first used outside the Christian context by Jewish Hellenic sage, Philo of Alexandria. Homoousios--"of the same substance"; the notion that the Father and the Son/Christ-Jesus are two Persons sharing same substance. Later, the Holy Spirit would be included as a Third Person sharing the same substance. Trinity--the Christian doctrine presaged in biblical passages Matthew 28:19, I Peter 1:2, and Isaiah 6:3, but fully worked out over the 3rd to 4th centuries, and finalized by Church fathers St. Gregory Nazianzen and the brothers Basil of Caesarea and Gregory of Nyssa and others at the Council of Constantinople in 381: namely, that God is Father, Son, and Holy Spirit—three Divine Persons (hypostases or personae[Latin]/prosopa[Greek], "mask" or "face") sharing one Divine Being, Nature, Substance or Essence (ousia). This doctrine, not accepted by all Christians (e.g., Unitarians), has been something of a "Christian koan" (to use a Zen term for a mind-breaking enigmatic riddle), a theological "mystery." Gregory Nazianzen wrote of the Triune Divine Persons: "They are divided indivisibly, if I may so say; and they are conjoined dividedly. For the Godhead is one in three, and the three are one, in whom the Godhead is, or, to speak more accurately, Who are the Godhead." Despite the officially "mysterious" nature of the Trinity doctrine, not to be understood at the level of the mind, it has nevertheless been used by orthodox Christians in Roman Catholicism, mainline Protestantism, and Eastern Orthodox Christianity as a touchstone to determine whether one is a heretic or not. Staunchly trinitarian Christians, incomparably valuing the personal aspect of God, are quite suspicious of Neoplatonic-influenced Christians who de-emphasize the Trinity in favor of a "prior-to-the-personal" Divine Absolute One as exalted in the apophatic via negativa (negative way) theologies of Pseudo-Dionysius Areopagite, Meister Eckhart, and many other mystics. For their part, it seems these apophatic mystics have felt the trinitarians verge on transforming the nondual, single God into a tri-theistic "polytheism." Much of the controversy over the Trinity doctrine could be resolved by positing God as trans-personal or supra-personal, beyond or above the personal. In other words, God transcends the personal but includes within the glorious Divine Nature all that we value as the personal (loving-kindness, sensitivity, responsiveness, generosity, joy, etc.). Regarding God as transpersonal or suprapersonal helps us bypass the forced choice of seeing God either as "impersonal" (like gas or a force in physics) or as merely "personal" in the usual anthropomorphic projection. Filioque--Western Christian notion (c.587) that the Holy Spirit proceeds from the Father "and the Son." The Eastern Orthodox Church rejects this, maintaining that the Holy Spirit proceeds directly from God the Father alone. Gospels--the "Good News" of God's saving of humanity through the ministry of Jesus. Kerygma--proclamation, the preaching of the gospel of Christ. Pentecost--the feast of the "fifty days" (after Christ's resurrection) celebrating the descent of the Holy Spirit into the lives of his apostles/disciples, who begin to spread Christianity. Kardia--the nonphysical heart, the spiritual center of our being, through which we love God. Nous--the intellect, that refined faculty of our being through which, when purified, we know God via gnosis. Dianoia--the discursive, conceptualizing mental faculty. Metanoia--change of mind/heart; renewal, conversion; marks the fundamental change away from the "old self." Askesis--the "training" of the spiritual athlete or ascetic, involving fasting, vigils, self-discipline, etc. Ecstasis--going beyond or outside oneself; experience of contemplative rapture. Via negativa--abiding in formless awareness of the Divine Dazzling Darkness, beyond thoughts or images. It was especially the writings of an anonymous monk, probably of Syria around 500 CE, taking the name Dionysius the Areopagite (after a 1st century figure), that promoted this lofty transcendence of the Divine. Translated from Greek into Latin by John Scottus Eriugena in the 9th century, Pseudo-Dionysius' via negative Neoplatonic theology had tremendous impact on later European mystics like Meister Eckhart and the Friends of God, and all in later centuries who were influenced by them. Via positiva--the mainstream way of Christian practice, involving worship of the Trinity, devotions, prayers, thematic meditations, etc. Soteria (Greek) / Yeshuah (Hebrew)--salvation, liberation from sin. Pleroma--fullness, fulfillment, becoming "perfect even as the heavenly Father is perfect." Theosis / deificatio--divinization of the soul; "God has become Man in order that Man might become God," as early Church fathers expressed it. This is only considered possible because humans are said to have been "created in the image and likeness of God" (Genesis 1:26)--and, since God is without image or likeness, as Meister Eckhart and other Christian mystics insisted, there is an "uncreated" (non-creaturely) aspect of the soul which is always one with the Divine Spirit and can be consciously realized as such in perfect theosis-deificatio. Apocatastasis--an idea emphasized by Church Fathers Gregory of Nyssa, Clement of Alexandria, Origen, Maximus the Confessor, and many others, going back to certain ideas expressed by St. Paul, holding that all souls will eventually be brought back into communion with God, since His infinite, omnipotent, omniscient grace and all-embracing love is obviously more powerful than even the most stubborn, self-centered free will. Even Satan will be redeemed. A small but growing number of authors today have shown that apocatastasis (or apokatastasis) was the metaphysical view held by the majority of early Christians until later a "crowd-control" fear-based theology of eternal hell rose to the fore among certain preachers, priests and bishops of the mainstream Episcopal version of Christianity. Kenosis--self-emptying and self-humiliation; the humble "dying to self" which Jesus lived & enjoined upon us, for instance, when he taught that one must "lose one's life for the everlasting life." Agapê (Gr.) / Caritas (Latin)--the perfect, spiritual love/charity of Christians for one another. Charismata--the gifts of the Holy Spirit, love, hope, faith, gift of healing, prophecy, discerning spirits, etc. It is these charismata that are emphasized again in the 20th century by the Pentecostal and Charismatic sects in Christianity. Hesychia--the utter contemplative "stillness" emphasized by the early Christian desert solitaries and monastics like St. Antony the Great and his followers; later elaborated by Gregory Palamas, it was made an orthodox doctrine of the Eastern church. Monk--(from Greek, monos, "alone")--a man living under the "evangelical vows" of poverty, chastity, and obedience to a spiritual confessor/superior, primarily engaged in worship of God and self-perfection. Cenobitic--the communal/monastic life of prayer and religious services. Canons Regular--priests bound by religious vows, living in community under a rule; unlike monks, are engaged in active pastoral ministry. Friars--"brothers"; members of religious "mendicant" orders of medieval origin who combine elements of monasticism with active ministries in the world; they are, principally, the 3 branches of Franciscans, the Dominicans, the Carmelites, the Augustinians, and the Servites. Tertiaries--men and women belonging to third orders, pious lay groups adhering to religious vows. Ikons--stylized Byzantine paintings of Jesus, Mary, and the Saints, considered to be windows onto divine plane; many ikons are said to have great spiritual powers, ability to heal illnesses, and transmit power of Spirit. 3 Virtues: Faith, Hope and Charity; 4 Cardinal Virtues: Prudence, Justice, Fortitude, Temperance. 7 Cardinal Sins: Pride, Greed, Lust, Anger, Gluttony, Envy, Sloth. Gnosticism--an early ascetic, mystical movement suppressed by the powerfully "triumphant" version of Church. Some forms of gnosticism are not impressive, suffering from a disturbing dualism between "spirit and matter," and a view that the material world is created by an evil demiurge, not by God. Montanists--an early (mid 2nd cent.) ecstatic, charismatic, puritanical Christian sect founded by Montanus. Arianism--"heretical" idea of Alexandrian priest Arius (d. c.336) denying Jesus is God, but was created by God. Actually, most New Testament scholars today agree with Arius' view in their conclusions about what the historical Jesus thought of himself. Manichaeism--"heretical" idea maintaining two eternal and opposed principles, good and evil (based on ideas of Persian charismatic leader, Mani, 216-77)—hence a form of radical dualism. Many circles of modern right-wing evangelical and pentecostal Christianity seem to fall into Manichaeism in their excessively frequent emphasis on Satan. Monophysism--"heretical" idea (condemned in 451) that Jesus has only one nature: pure divinity—he wasn't at all human. Nestorianism--"heretical" idea (condemned in 431) that Jesus was not one combined divine-human person, but two persons: God the Son and the man Jesus, somehow associated together. Docetism--"heretical" idea of "only seeming"; namely, the notion that Jesus' humanity and his pains during the Passion were apparent, not real. This is a gnostic view that the crucifixion and scourging were an illusion since Jesus was not susceptible to suffering. The view that Jesus miraculously escaped death on the cross (as the Qur'an of Islam states and some modern avant-garde theologians like Holger Kersten believe) is also termed docetic. Pelagianism--the "heretical" idea (promoted by Pelagius, a British monk, d. c.420) that Adam's original sin does not affect us; thus, there is no real need for grace and salvation. Augustine opposed this doctrine in the 5th century, but in the 9th century the impressive mystic theologian John Scotus Eriugena tried to argue that all souls are indeed created from what we might call Original Innocence, though Divine Grace is needed for all to consciously return to God. Albigenses / Cathars--an "heretical" sect of fervent piety & asceticism that flourished in southern France & elsewhere in 11th/12th centuries; the Albigensians or Cathari were brutally suppressed by the Vatican's forces during Albigensian Crusade. Inquisition--several hundred year-long work from 13th century onward to find, investigate and convert heretics for the sake of their own salvation and the orthodox-orthoprax purity (right beliefs, right practices) of the Church. Gottesfreunde--"Friends of God," the sublime Rhineland mystical-contemplative movement of the 14th century started by Meister Eckhart, Johann Tauler, John of Ruysbroeck, Henry Suso, et al., involving many Beguine women and Beghard men of the widespread, populous lay communities that had started in the 13th century, practicing great austerity and deep inner contemplation. Notable Beguine women include the 12th century mystic Hildegard of Bingen (1098-1179) and then Mechtild of Magdeburg (1210-c.1290), Gertrude of Helfta (1256-1301), Hadewijch of Antwerp (early 13th c.), et al. Waldensians--14th-century laygroup following Peter Valdes, preaching scriptures, poverty, and the priesthood of all Christians. Jansenism--"heretical" idea started by Jansen, bishop of Ypres (d. 1638) that free will is ultimately an illusion and doesn't exist; only God's will exists. Bollandists--Jesuit scholars who scientifically study the lives & deeds of the saints; centered in Brussels. Holiness movement--a fervent devotional, mystical, service-oriented movement started primarily by Methodists in the mid-19th century, emphasizing metanoia and sanctification. Pentecostal movement--a fervent devotional, ecstatic movement commencing around the turn of the 20th century, emphasizing metanoia, sanctification & the "born again" experience of baptism in the Holy Spirit, usually said to be characterized by glossolalia, speaking in tongues. Charismatic movement--a neo-Pentecostal movement primarily composed of Catholics and mainline Protestants. Purification, Illumination, Union--the 3 phases of the mystic way as articulated by Evelyn Underhill in her classic works on mysticism, which she finds characteristic of Western (chiefly Christian) mystics. Beatus / Beata--a male or female "blessed" who has been officially granted the first step in canonization. The traditional New Testament, featuring the Four Gospels of Mark, Matthew, Luke & John and various other works such as the Acts of the Apostles, the Epistles by Paul and other authors, and the bizarre apocalyptic work, Book of Revelations, exists in different translations: e.g., the Authorized/King James Version; the New American Bible; the New Jerusalem Bible; the New Revised Standard Version (NSRV—the choice of most scholars). See the 3,400-page The Complete Parallel Bible: With the Apocryphal/Deuterocanonical Books, Oxford U. Press, 1993, containing passage-by-passage comparisons of the 4 major gospels. See also The Anchor Bible (with commentary), published by Doubleday; and its highly useful companion, the massive Anchor Bible Dictionary (David Noel Freedman, Ed. ), 6 vols., 1992 (with input from nearly 1000 scholar-contributors). See also Oxford Univ. Press' Oxford Companion to the Bible (B. Metzger & M. Coogan, Eds. ), 1993, and The HarperCollins Study Bible (W. Meeks, Ed. ), 1993. The radical Jesus Seminar panel of scholars has compiled The Complete Gospels (Robert Miller, Ed. ), HarperSF/ Polebridge, 1994; this includes the important non-canonical works, the Gospel of Thomas, and a reconstruction of the “Q” text. See a huge umbrella website for scholarly materials on the Thomas Gospel, Q Text, and early Christianity created by Stevan Davies at his “Gospel of Thomas” homepage (check Google for current URL address). The following list of primarily scholarly books (assembled in 1995 with several additions since then) is certainly not complete, but features important recent works of the so-called “Third Quest” for the historical Jesus, along with a few influential works of earlier scholarship. Not included here are devotional works of mainstream churches. Note well: there is no single consensus among Biblical scholars concerning Yeshua's life, deeds, and sayings. Of the five or so camps of Biblical scholarship existing, two main divisions are a traditionalist view and a more radical view (such as espoused by the Jesus Seminar scholars). The former view trusts the Four Gospels as basically reliable; the latter view does not, claiming that much of the Gospels are fiction. Ashton, John, Understanding the Fourth Gospel [the John gospel], London: Oxford U. Press, 1993. Batey, Richard, Jesus & the Forgotten City, Grand Rapids, MI: Baker, 1992 (on the Hellenistic influences on Jesus). Bockmuehl, Markus, This Jesus: Martyr, Lord, Messiah, InterVarsity, Amer. ed., 1996/1994 (traditional view of Jesus). Borg, Marcus, Meeting Jesus Again for the First Time, HarperSF, 1994 (good intro. work by a Jesus Seminar member, argues for Jesus as “Spirit-person”); Jesus in Contemporary Scholarship, Valley Forge, PA: Trinity, 1994; and other works, including a small book that compares the teachings of Jesus and the Buddha. Bowden, John, Jesus: The Unanswered Questions, London: SCM, 1988 (a leading British minister questions myths). Brown, Raymond, The Critical Meaning of the Bible, Paulist, 1981; Biblical Reflections on Crises Facing the Church, Paulist, 1975; The Birth of the Messiah, Doubleday, 1977; Recent Discoveries & the Biblical World, M. Glazier, 1983; The Death of the Messiah, 2 volumes; Doubleday, 1994 (one of the most eminent scholars of the moderate-conservative camp of scholars). Bultmann, Rudolf, The History of the Synoptic Tradition, Oxford, 1963/1921; Bultmann, et al., Kerygma & Myth: A Theological Debate, 2nd ed., London: SPCK, 1957 (by an influential scholar of the existentialist “2nd Quest”). Charlesworth, James H (Ed. ), The Messiah, Minneapolis: Augsburg Fortress, 1992; Charlesworth & W.P. Weaver (Eds. ), Images of Jesus Today, Valley Forge, PA: Trinity, 1994; Jesus’ Jewishness: Exploring the Place of Jesus in Early Judaism, NY: Crossroad, 1991 (fine collections of articles by leading scholars). Crossan, John Dominic, The Historical Jesus: The Life of a Mediterranean Jewish Peasant, 1992; Jesus: A Revolutionary Biography, 1994; The Essential Jesus: Original Sayings & Earliest Images, 1994; Who Killed Jesus? Exposing the Roots of Anti-Semitism in the Gospel Story of the Death of Jesus, 1995; Who Is Jesus? 1996 (all published by HarperSF) (important works by a leading Jesus Seminar scholar, an ex-Catholic priest; his methodology has been severely critiqued by traditionalists; Crossan and others see Jesus as a kind of Jewish “Cynic” healer/reformer, a Jewish-world equivalent to Cynics like Diogenes). Davies, Stevan, Jesus the Healer, Continuum, 1994 (fascinating look at Jesus and spirit possession, based on cross-cultural anthropological studies); The Gospel of Thomas & Christian Wisdom, Bardic Press rev. ed., 2004 (an updated classic). De Jonge, Marinus, Jesus, the Servant-Messiah, New Haven, CT: Yale Univ. Press, 1991 (traditionalist view). Dimont, Max, Appointment in Jerusalem: A Search for the Historical Jesus, NY: St. Martin's Press, 1991. Eisenman, Robert, The New Testament Code: The Cup of the Lord, the Damascus Covenant, and the Blood of Christ, London: Watkins, 2006 (dense but deeply interesting, pioneering and controversial thesis of a “Palestinian Messianism” led by James and Jesus, by the author of James, the Brother of Jesus, 1997 and The Dead Sea Scrolls and the First Christians, 1996). Evans, Craig, Jesus, Grand Rapids: Baker, 1992; A Life of Jesus Research: An Annotated Bibliography, E.J. Brill, 1989; Non-canonical Writings and New Testament Interpretation, Peabody, MA: Hendrickson, 1992; Chilton, Bruce & C. Evans (Eds. ), Studying the Historical Jesus: Evaluations of the State of Current Research, Leiden: Brill, 1994. Funk, Robert & Roy Hoover (Eds. ), The Five Gospels: The Search for the Authentic Words of Jesus, HarperSF, 1993, and R. Funk & The Jesus Seminar, The Acts of Jesus: What Did Jesus Really Do? HarperSF, 1998 (these are the infamous color-coded collections by the Jesus Seminar panel of scholars that infuriated more traditional scholars). Grant, Robert, Jesus After the Gospels: The Christ of the Second Century, Westminster John Knox, 1990. Hick, J. (Ed. ), The Myth of God Incarnate, London: SCM / Philadelphia: Westminster, 1977 (fine British collection). Johnson, Luke Timothy, The Real Jesus: The Misguided Quest for the Historical Jesus and the Truth of the Traditional Gospels, HarperSF, 1996. (Johnson's traditionalist approach and Crossan's more skeptical approach clashed in a famous online forum in 1995-6 sponsored by HarperSF, which led to the creation of the Crosstalk online forum of New Testament scholars that over the years have pursued much further the quest for the Historic Jesus). Kaylor, R. David, Jesus the Prophet: His Vision of the Kingdom on Earth, Westminster/John Knox, 1994. Kloppenborg, John (Ed. ), The Shape of Q: Signal Essays on the Sayings Gospel, Minneapolis: Fortress, 1994. McCready, Douglas, Jesus Christ for the Modern World: The Christology of the Catholic Tubingen School, P. Lang Publications, 1990 (sums up scholarship from Strauss [begun 1835], Baur, Lachmann, to present). Mack, Burton, Who Wrote the New Testament? The Making of the Christian Myth, HarperCollins, 1995; The Lost Gospel: The Book of Q & Christian Origins, HarperSF, 1993; A Myth of Innocence: Mark & Christian Origins, Philadelphia: Fortress, 1988 (intriguing works by the most radical, "minimalist" skeptic among the Jesus Seminar scholars). Meier, Rev. John P., The Mission of Christ & His Church: Studies in Christology & Ecclesiology, Liturgical Press, 1990; A Marginal Jew: Rethinking the Historical Jesus, 3 vols., Doubleday, 1991 onward (magisterial works by the most respected Bible scholar of our day; a Catholic priest, Meier questions many traditional claims about Jesus, but his careful work yields a traditionalist portrait of Jesus as miracle-worker and eschatalogical wisdom teacher). Mitchell, Stephen, The Gospel According to Jesus: A New Translation & Guide to His Essential Teachings for Believers and Unbelievers, HarperCollins, 1992 (uneven work; yet, alone among N.T. works, Mitchell's work references Zen, Ramana Maharshi, and adepts of other wisdom traditions). Morris, Leon, Jesus Is the Christ: Studies in the Theology of John, Grand Rapids, MI: Eerdmans, 1989. Pagels, Elaine, Beyond Belief: The Secret Gospel of Thomas, NY: Random House, 2003 (this is more about the John Gospel and Christian councils, but still a very informative approach to diverse aspects of Christianity’s development of orthodox Christology). Paramananda, Swami, Christ and Oriental Ideals, 5th ed., Vedanta Center, 1989 (from a Hindu Vedanta viewpoint). Patterson, Stephen J., The Gospel of Thomas & Jesus, Polebridge, 1993 (proves this Gospel’s independence from the synoptics). Rahner, Karl, Theological Investigations, 13 vols., various translators; Helicon/Crossroads, 1961ff. Ranke-Heinemann, Uta, Putting Away Childish Things: The Virgin Birth, the Empty Tomb, and Other Fairy Tales You Don’t Need to Believe to Have a Living Faith, Harper Collins, Amer. ed., 1994 (by a radical German scholar). Reader's Digest, The Story of Jesus: A Treasury of Great Works of Art & Literature Inspired by the Life of Jesus, 1993. Riley, Gregory, One Jesus, Many Christs: How Jesus Inspired Not One True Christianity But Many, Fortress Press ed., 2000; The River of God: A New History of Christian Origins, HarperOne, 2003; Resurrection Reconsidered: Thomas & John in Controversy, Minneapolis, MN: Fortress Press, 1995 (brilliant scholarship on Christianity's Jesus-story in the Hellenistic context). Robinson, James (Ed. ), The Nag Hammadi Library, Harper & Row, 1981 (on the famous gnostic collection discovered in Egypt in 1945; most important work herein is the Gospel of Thomas). Robinson, J..A.T., Honest to God, 1963; The Human Face of God, 1972; Redating the New Testament; all publ. by SCM, London; Can We Trust the New Testament? London: Mowbray, 1977. Sanders, E.P., Jesus and Judaism, Philadelphia: Augsburg Fortress, 1985; The Historical Figure of Jesus, London: Penguin, 1993; Judaism: Practice & Belief 63 B.C.E. — 66 C.E., Trinity, 1992 (by a leading Jewish scholar). Schweitzer, Albert, Quest for the Historical Jesus: A Critical Study of Its Progress from Reimarus to Wrede, NY: Macmillan, 1968/1906 (important historical work; the culminating work in the “1st Quest” for the historic Jesus). Shanks, Herschel (Ed. ), The Search for Jesus: Modern Scholarship Looks at the Gospels, Washington, DC: Biblical Archaeology Review, 1994. Sheehan, Thomas, The First Coming: How the Kingdom of God Became Christianity, Random House, 1986 (fine, if somewhat dated, summary of modern scholarship, based on Bultmann, Bornkamm, Fitzmyer, Schillebeeckx, et al). Sinclair, Scott, Jesus Christ According to Paul: The Christologies of Paul's Undisputed Epistles [...], BIBAL, 1988. Smith, Morton, Jesus the Magician, Harper & Row, 1978; The Secret Gospel, Harper & Row, 1973 (Prof. Smith argues that Jesus went to Egypt & learned magical rites; most scholars disagree with many of his conclusions). Snyder, Mary, The Christology of Rosemary Radford Ruether: A Critical Introduction, Twenty-Third Publ., 1988. Twelftree, Graham, Jesus the Exorcist, Tubingen: Mohr, 1993. Vermes, Geza, The Religion of Jesus the Jew, Minneapolis: Augsburg Fortress, 1993; Jesus the Jew, A Historian's Reading of the Gospels, London: Collins, 1973 (by a leading Jewish Bible scholar & expert on Dead Sea Scrolls). Wells, G.A., Who Was Jesus? A Critique of the New Testament Record, La Salle, IL: Open Court, 1989 (a British rationalist-skeptic considers "Jesus" a mere legend; Ian Wilson persuasively defeated this position). Wilson, A.N., Jesus: A Life, NY: W.W. Norton, 1992 (a demythologizing work by a popular biographer). Wilson, Ian, Jesus: The Evidence, Harper & Row Amer. ed., 1988/1984 (well-illustrated introductory overview). Witherington, Ben, III, The Jesus Quest: The Third Search for the Jew of Nazareth, IL: InterVarsity Press, 1995 (fine overview of many different positions in modern Jesus research, including Witherington’s persuasive position that sees Jesus as embodiment of God’s Wisdom; see also The Christology of Jesus, Fortress, 1990; Jesus the Sage: The Pilgrimage of Wisdom, Augsburg Fortress, 1994; Jesus, Paul, and the End of the World, InterVarsity, 1992). Wright, N.T., Who Was Jesus? Eerdmans, 1993; The New Testament & the People of God, Vol. 1 of Christian Origins and the Question of God, Minneapolis: Fortress, 1992 (voluminous Christian retort to the demythologizing books). NB—There are also to be found numerous Christian "psychic" as well as "new age" accounts of the life and teachings of Jesus, such as by Anne Catherine Emmerich, Sister Josefa Menendez, Edgar Cayce, the Urantia Book, Levi's Aquarian Gospel of Jesus Christ, Course in Miracles, etc. None of these are reliable works, though their contents may be quite inspiring as fiction. On the controversial idea that “Jesus went to Buddhist monasteries in India,” a non-scholarly work is Holger Kersten, Jesus Lived in India, Element, 1994/1986. See similar books by Janet Bock (the first in this genre), Charles Potter, & Elizabeth C. Prophet. See also Paul Pappas, Jesus' Tomb in India: Debate on His Death & Resurrection, Berkeley, CA: Asian Humanities, 1991, which takes a different view. Most mainstream scholars completely ignore the idea of Jesus in India. On the controversial “Shroud of Turin,” two popular works are: Holger Kersten & Elmar Gruber, The Jesus Conspiracy, Element Books, 1994 (argues that the shroud is authentic, but shows a Jesus who did not die on the cross, arguing that the John Gospel author knew “the real truth”); and Lynn Picknett & Clive Prince, Turin Shroud: In Whose Image? HarperCollins, 1994 (argues that Leonarda Da Vinci created the shroud image housed today at Turin). There are scores of books and countless articles on various aspects and eras of Christian mysticism, not to mention hundreds of books and thousands of articles on individual mystics. Here we only list a few: for starters, the important book-publication series on individual mystics, entitled "The Classics of Western Spirituality," featuring primarily Christian spiritual masters with a number of Jewish and Muslim Sufi figures as well. This important series, now including several dozens volumes, is published by the Paulist Press (Mahwah, NJ). See also the more recent "Traditions of Christian Spirituality" on the Franciscans, Dominicans, Cistercians, Quakers, Anabaptists, and other Western orders and denominations, as well as on Eastern Orthodox Christianity, published by Orbis Books (Maryknoll, NY). See Bernard McGinn's magisterial 4-volume The Presence of God: A History of Western Christian Mysticism, published by Crossroad-Herder (NY), including The Foundations of Mysticism: Origins to the Fifth Century (vol. 1, 1991), The Development of Mysticism: Gregory the Great through the Twelfth Century (vol. 2, 1996), The Flowering of Mysticism: Men and Women in the New Mysticism 1200-1350 (vol. 3, 1998), The Harvest of Mysticism in Medieval Germany (vol. 4, 2005). See a 3-volume series published by Crossroad: Bernard McGinn & John Meyendorff (Eds. ), Christian Spirituality: Origins to the Twelfth Century, 1986; Jill Raitt (Ed., with B. McGinn & J. Meyendorff), Christian Spirituality: High Middle Ages and Reformation, 1987; Louis Dupré & Don Saliers (Eds. ), Christian Spirituality: Post-Reformation and Modern, 1981. Other general surveys on Christian mysticism include: Louis Bouyer, Jean Leclerq, et al., A History of Christian Spirituality, 3 vols., London: Burns & Oates, 1968; Louis Dupré & James Wiseman (Eds. ), Light from Light: An Anthology of Christian Mysticism, Paulist Press, rev. ed., 2001; James Wiseman, Spirituality and Mysticism: A Global View (all aspects of Christian spirituality in its different contexts), Orbis, 2006; Richard Woods, Christian Spirituality: God's Presence through the Ages, Orbis rev. ed., 2006; Harvey Egan (Ed. ), An Anthology of Christian Mysticism, Collegeville, MN: Liturgical Press, 1991; Paul De Jaegher, An Anthology of Christian Mysticism (Donald Attwater, et al. Transl. ), Springfield, IL: Templegate, 1977; Eric Colledge, The Medieval Mystics of England, NY: Charles Scribner's Sons, 1961; Richard Woods, The Spirituality of the Celtic Saints, Orbis, 2002; Emilie Zum Brunn & Georgette Epiney-Burgard, Women Mystics in Medieval Europe (Sheila Hughes, Tr. ), NY: Paragon, 1989; Vladimir Lossky, The Mystical Theology of the Eastern Church, London: J. Clarke, 1957; Lossky, The Vision of God, London: Faith Press, 1963; George Maloney, Pilgrimage of the Heart: A Treasury of Eastern Christian Spirituality, Harper & Row, 1983; Anne Fremantle, The Protestant Mystics, Boston: Little, Brown, 1964; Frank Senn (Ed. ), Protestant Spiritual Traditions, Paulist, 1986; etc. We must of course also mention here William James' pioneering Varieties of Religious Experience (1902) based on his Gifford Lectures, and some of the classic early 20th-century surveys on mysticism, such as the several books written by the Anglican Evelyn Underhill (beginning with her famous volume Mysticism in 1911), and works by others including Baron Friedrich von Hügel, Anglican Dean William Ralph Inge, Kenneth Escot Kirk, the Quaker Rufus Jones, Catholic abbot Edward Cuthbert Butler, and French Catholics A.F. Poulain, Abbe Saudreau and their many supporters and critics in France and Germany, all emphasizing Christian mysticism, and still worth reading today, along with the general surveys and studies of mysticism that followed, again tending to generally or specifically emphasize Christian mysticism, such as the volumes by R. Otto, R.C. Zaehner, H. Bergson, J. Maritain, D. Knowles, E. O'Brien, W. Stace, F. Staal, J. Hick, J. Daniélou, T. Merton, R. Woods, W. Johnston, H. Urs von Balthasar, G. Parrinder, N. Smart, W. Wainwright, and R. Forman, the last rebutting much of the postmodernist "deconstructive" views of mysticism advanced by S. Katz, et al. c.7-6 BCE--Birth of Yeshu/Yeshua (Greek: Jesus), probably at Nazareth, Galilee, not Bethlehem. c.28 CE--Beginning of public ministry of Yeshua, who heals, preaches “God’s domain/rule,” and offers "open table fellowship" inclusive of all persons male and female, rich and poor, healthy and disabled, the ritually pure and impure, old and young. c.30 CE--Yeshua's death and "resurrection"/"ascension" (most likely on the subtle energy level of the soul), evidently followed fifty days later by the bestowing of Spirit on disciples in the phenomenon known as the Pentecost. 30-60--Missionary activity of St. Paul, a former anti-Christian Jew now turned anti-Jewish Christian. Writes important letters/epistles from 50 on. Other writers are forging works in Paul's name or tampering with his authentic epistles during his own lifetime and afterward. c.50-70--Gospel of Thomas, reflecting an early, proto-Gnostic tradition of Yeshu's sayings; highly mystical and anti-apocalyptic, arguing for an intuitive "finding" in the here-now of one's original Divine Identity "before the beginning." early 70s--Gospel of Mark, evidently the earliest of the canonical gospels (composed after the Gospel of Thomas) and the least "mythologized" with the kind of prophetic and pagan elements found in the other three canonical gospels (Matthew, Luke, and John). c.80-90--Gospels of Luke, then Matthew (NB: like Gospel of “Mark,” these gospels were not written by their namesakes, but by authors-compilers humbly taking the names of first-generation Jesus-followers; this was a common practice in the ancient world). c.80-100--Acts of the Apostles written by the same author who penned the Gospel of Luke (Luke-Acts should be read as one book). c.90-100--Gospel of John, showing a blend of original narrative material (the “Signs Gospel”) mixed with Hellenistic (pagan) ideas, and arguing against the Thomas Gospel community's idea of an intrinsic Divine Nature--Divinity is only to be found in Christ (the John Gospel invents the idea of "doubting Thomas" as part of its polemical thrust). early 100s--Rise of the 3-fold ministry in Church: episkopos/bishop, presbyter/priest, and diakonos/deacon. 110--Pliny the Younger, Roman governor of Bithynia, an outlying province on the coast of what is now northern Turkey (Asia Minor), writes Emperor Trajan that multitudes of persons of every social class, from the cities to villages and rural areas, have converted to Christianity, and that the Hellenistic temples have lost most of their adherents. His and others' persecution of Christians soon brings more people back to the temples. The next few centuries will see periods of expansion and contraction in numbers of Christians in different regions of the Roman empire as policies of tolerance and persecution of Christianity alternate depending on who is governing a province or the empire. 160-220--Life of Tertullian, a former Roman lawyer who became the Church Father primarily responsible for the Trinity doctrine and anti-paganist defense of Christianity to the Roman magistrates. Around 200 he boasted, likely with some exaggeration, that "nearly all the citizens of the cities are Christians." 180-253--Life of Origen, who, along with his mentor Clement of Alexandra (d. 215), was one of leading Church Fathers formulating Christian doctrine; he spoke of reincarnation and apocatastasis, universal salvation, an idea that was evidently far more widespread than later Catholic tradition would have us think (see www.Apocatastasis.org). 250 on--Renewed heavy persecution of Christians by Roman emperors and others; many Christians embrace martyrhood. 312--Constantine wins Milvian Bridge battle; as emperor, he builds Constantinople, and then makes Christianity the new state religion; other religions will soon be persecuted and suppressed, some of their leading figures murdered. By the 5th century, most of the Roman Empire is Christian. 251-356--Life of St. Antony the Great, first of the illustrious Desert Fathers to go live the eremitic (hermit) life in the wilderness of Egypt. He was an inspiration and wise counselor to a multitude of souls who visited him. 292-346--Life of St. Pachomius, founder of the first monastic-cenobitic community, at Tabennisi, Egypt, c.320. The idea of such communal living spreads to the West. 325--Council at Nicaea in Asia Minor; herein Athanasius defeats Arius' so-called "heresy" on the “created” nature of Jesus (though Arius’ view seems right to modern N.T. scholarship); the Nicene Creed is formulated. Major Councils would also be held in 381, 431, 451, 553, 680, and 787 CE, refining the “correct” Christian doctrine. Some of the decisions are theologically rather arbitrary, heavily politicized, and thus questionable as constituting true "orthodoxy." 330-79--Life of St. Basil the Great, theologian; his sister St. Macrina and then Basil inaugurated Orthodox monasticism. Their brother Gregory of Nyssa wrote key early works with many crucial mystical insights important for later tradition. 340--Athanasius, Ammonius, and Isidore are in Rome, spreading monastic ideas to the West. 354-430--Life of St. Augustine, Bishop of Hippo, most influential of early Christian writers formulating key doctrines. He sometimes brings a darker vision of Christianity with his emphasis on sinfulness. c.385-460--Life of St. Patrick, Bishop of Ireland; his followers "saved/preserved civilization" during Europe's Dark Ages and brought it back to the Continent. Patrick, in contrast to Augustine, emphasizes a somewhat more open-minded, natural kind of Christianity, focusing more on original innocence than sinfulness--a more suitable approach in his mission to the Celts. 367--Canon of the New Testament is finally compiled, after much wrangling and arguing among bishops. Certain key works (like the Gospel of Thomas and Q-text) are left out. 410--Rome falls to the Goth invaders; Constantinople in East becomes center of Christendom. 420-30--St. John Cassian writes Institutes and Conferences, and founds two monasteries in southern France. 500--Pseudo-Dionysius Areopagite, an anonymous monk likely from Syria, writes his hugely important tracts on apophatic / via negativa mystical theology and also kataphatic theology. 480-547--Life of St. Benedict; he establishes monasteries at Subiaco and Monte Cassino and writes a moderate set of guidelines (the Rule) for Benedictine monastics to live by. 640-750--Spread of Islam throughout Middle East, North Africa, Asia Minor, and Southern Europe. The Muslim “golden age” begins, which will later influence and enrich Europe when Crusaders return from the Middle East to Europe in the 11th-14th centuries, occasioning the European Renaissance. early 700s--St. Boniface (680-754) missionizes in Germany. 800-1100--the Dark Ages in Europe; centralization of papal power. 800-c.877--Life of Irishman John Scottus Eriugena, "greatest mind of early Middle Ages," a panentheist theologian teaching at the famed Carolingian court in France; Eriugena (or Erigena) brings into European Christianity many key insights of the Greek Christian Fathers like the idea of apocatastasis (universal salvation for all souls). Eriugena is the link between the Christian mysticism of antiquity and the mysticism of crucially important later Medieval figures like Meister Eckhart. Called "the greatest theologian between Augustine and Aquinas," I find him to be more profound than both men. 950-1350--Crusades against Muslims to reclaim Holy Land, fought by Knights Templars, Knights Hospitaller, et al. ; generally a failure, but the intrusion into the Middle East exposes Europe to Muslim thought and translations of Greek philosophers, all of which stimulates the rise of Scholastism, alchemy, etc. 963--Athanasius the Athonite (920-1003) comes to Mt. Athos, Greece, where hermits had kept alive the tradition of "Desert Christianity"; he builds the Lavra, the first communal monastery there. Mt. Athos becomes the leading center of the hesychast Christian contemplative movement practicing profound hesychasm "stillness" (after Psalms 46:10, "Be still and know that I am God"). 988--Russia converts to Christianity through the influence of its prince, St. Vladimir. 1054--Final split between Western Christianity (Roman Catholicism) and the Eastern Orthodox Church. 1090-1153--Life of St. Bernard of Clairveaux, miracle-worker, theologian, abbot-founder of the Cistercian reform within the Benedictine order, and a staunch promoter of the Western "cult" to Mary (which originally arose out of the Isis-influenced regions of Eastern Christianity). 1182-1226--Life of St. Francis of Assisi, Italy, whose founding of an order of mendicant friars, and love of "Lady Poverty" and contemplative mysticism helped renew a terribly stagnating Roman Catholic Church. Several branches of Franciscan friars arose. 1170-1221--Life of St. Dominic, the famous preacher; his Dominican Order gave rise to many of the most illustrious scholars-teachers of the Middle Ages. 1200s-1300s--Proliferation of religious orders such as the Cistercians, Camaldolese, Franciscans, Dominicans, tertiaries, et al. 1200s-1300s--Proliferation in northern continental Europe of the Beguines: co-habitating contemplative laywomen. Loosely affiliated with Dominicans / Franciscans, Beguines took no final vows, followed no rule, supported themselves by manual labor, interacted with the world, and were celibate, with freedom of movement, economic independence and spiritual creativity. The male counterpart of the Beguines were the Beghard communities. 1260-1327--Life of Meister Eckhart, the towering mystic-preacher-theologian of University of Paris and German provinces, the primary influence on the “Friends of God” movement of Christian mystics; Eckhart articulated a strongly “nondual,” mystical Christianity. 1314-92--Life of Sergius of Radonezh, abbot and first great mystic of Russian Orthodox Christianity. 1521--Martin Luther is excommunicated by Catholic Church four years after his famous public protest in 1517; Protestantism officially begins (Valdes, Wycliffe, and Huss had made earlier such attempts); thereafter occurs the rise of Lutheran, Anglican, Presbyterian, and Reform churches as well as more radical groups (Anabaptists, Pietists, et al.) who attempt to return their practice to that of early Christianity, with a simple, austere life, and total freedom from dogma, needless sacraments, etc. 1545-63--Council of Trent begins Catholicism's Counter-Reformation, which has a renewing effect. 1640s--George Fox (1624-91) establishes the Quakers (Society of Friends), who endeavor to remain open and sensitive to God's ongoing revelation in the heart. The Quakers would be heavily persecuted, especially in America, for claiming to receive Divine inspiration like the Gospel authors and early Christians. 1703-91--Life of John Wesley, founder of Methodism, an evangelical, charismatic response to the rationalistic Deism that arose with the European Enlightenment and birth of science. 1730s-40s--the "Great Awakening" of piety among New England Protestants, led by Jonathan Edwards, Cotton Mather, et al. 1759-1833--Life of St. Seraphim of Sarov, an impressive contemplative and wonder-worker, one of Russian Orthodoxy's most eminent saints. 1800s--"European Enlightenment" period ushers in era of rationalistic science and philosophy. 1900--Pentecostal movement is born at Topeka, Kansas (quickly spreads to Texas, Los Angeles, and then to many regions). 1945--Discovery of Gnostic Christian manuscripts at Nag Hammadi, upper Egypt, most important of which is the astounding Gospel of Thomas collection of sayings attributed to Jesus. 1960--Charismatic movement dawns in Van Nuys, California, and takes off at Yale Univ., Univ. of Michigan, and Notre Dame University. 1962-5--Second Vatican Council is called by Pope John XXIII to bring new directions and ecumenical openness for the Roman Catholic Church. This was a remarkable period of progressive, liberal renewal within the Catholic Church, celebrated by thousands of bishops, priests, nuns/sisters, and laity; but, with certain excesses of liberalism, the new trend triggered a strong backlash among conservatives, and subsequent popes (John Paul II and Benedict XVI, formerly Cardinal Ratzinger) ushered in a strongly conservative period for the church, appointing many conservative archbishops and bishops to steer Catholicism back to a more "orthodox-orthoprax" expression. 1980--Archbishop Romero murdered—a landmark in the rise of "liberation theology" social justice movement which had begun in 1968 in Latin America, a movement that has spread to Africa, Asia, and the USA. Liberation theology, which is supported by many sections of the revised Catholic Catechism and echoed in the official statements on Christian economic doctrine within other Christian denominations, argues for "the universal destination of goods": "the wealth of the earth is created by God for the good of all, not just for the privileged few." Liberation theology argues and demonstrates through actual lifestyle that Church leaders must live and act in solidarity with the poor, and that the Church should express a "preferential option for the poor" and not side with society's elite business-investor stratum, which tends to disfranchise and exploit the downtrodden poor. Late 1980s--Freedom of religion granted in various countries of the former Soviet Union and eastern Europe after decades of Communist oppression. 1994--the 2,000th “birthday” of Yeshu/Jesus. One of the peak years for publishing books and articles as part of the "Third Quest" for finding real facts on the "Historical Jesus." c.2008--The number of Christians (both devout and nominal) worldwide reaches 2 billion mark out of nearly 7 billion humans alive at the time. Jerusalem, Israel--site of the former great Jewish temple, Mt. Calvary, etc. ; see monastery of Mar Saba nearby. el-Tabgha, just west of Capernaum, may have been Jesus' preferred retreat site where he also multiplied the loaves and fishes, gave the Sermon on the Mount, etc. Ephesus, Turkey--a major site of early Christian activity; here is Mount Miryam, said to have been the earthly home of Mother Mary ; here also lived John the Evangelist, Philip and his prophetess-daughters, et al. 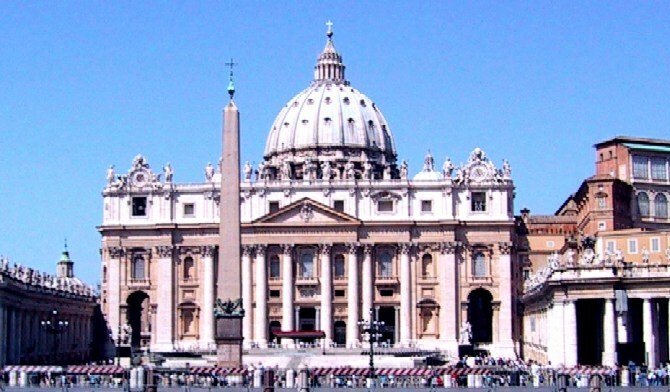 Rome, Italy--burial site for many popes & saints; here is the Basilica of St. Peter's, & the Vatican. Mt. Subiaco & Monte Cassino, Italy--site of Benedict's first monastic foundations in Europe in early 6th cent. Compostela, Spain--legendary burial site of St. James the Greater, a favorite pilgrim spot in medieval Europe. Assisi, Italy--many chapels & churches and tombs of Sts. Francis, Clare, & other Franciscans saints (see also Mt. Alverna north of here where Francis received the stigmata & many Franciscans lived). Sienna, Italy--associated with St. Catherine of Sienna (1347-80), co-patron saint of Italy along with St. Francis. Florence, Italy--the Convent of San Marco, with paintings by Fra Angelico; a center for Rennaissance humanism. Avila, Spain--center of Carmelite reform movement of St. Teresa of Avila (1515-82). Ars, France--memorial to St. Jean Baptist Vianney, the hgely popular Curé of Ars (1786-1859). Paris and Chartres--site of some of the finest Gothic cathedrals. Glastonbury--site of early Christian activity in the British Isles, supposedly led by Joseph of Arimathaea in the first century; legends of the Holy Grail center here. Mt. Athos, Hagion Oros ("the Holy Mountain")--spiritual center of Eastern Orthodoxy since eclipse of Christianity in the Middle East after Islam’s rise; many monasteries & hermit dwellings are here. Augsburg, Germany--site of Martin Luther's retreat and translation of New Testament into vernacular. Guadalupe, Mexico--site of Marian appearance to Juan Diego in 1531; famous pilgrim site. Lourdes, France--site of the miraculous Marian appearance to Bernadette Soubirous, 1858, a huge international Catholic pilgrimage destination, and place where numerous healing miracles have been documented and analyzed. Fatima, Portugal--site of Marian appearance to 3 children and solar phenomena witnessed by multitude in 1917. Medjugorge, ex-Yugoslavia--site of the most recent major Marian appearances, from 1981 on. Betania, Venezuela (outside Caracas)--site of major Marian apparitions & home of the late householder mystic-stigmatic, Maria Esperanza. Kiev, Ukraine--site of the Monastery of the Caves, founded by St. Theodosius, Russia's first saint. Divyeyvo, Russia--site of activity of St. Seraphim, Pelagia Ivanovna, and many other saints. IMPORTANT CATHOLIC RELIGIOUS ORDERS: Benedictines, founded by St. Benedict of Nursia; Cluniacs (reform of Benedictines by second abbot of Cluny, St. Odo, 879-942); Cistercians (including Trappists), the order mainly spread by St. Bernard of Clairveaux; Carthusians, f. by St. Bruno; Augustinian Canons; Premonstratensian Canons, f. by St. Norbert; Camaldolese, f. by St. Romuald; Dominicans, f. by St. Dominic; Franciscans (Friars Minor, Poor Clares, 3rd Order), f. by St. Francis of Assisi; Brethren of Deventer and Zwolle, f. by Gerard Groote; Friars Minimi, f. by St. Francis of Paola; Discalced Carmelites, f. by St. Teresa of Avila & St. Juan de la Cruz; Jesuits, f. by St. Ignatius Loyola; Servite Friars; Redemptorist priests; Vincentian priests; Congregation of the Oratory, f. by St. Philip Neri; Salesian priests, f. by St. John Bosco; Claretian priests, f. by St. Antonio Maria Claret; Missionaries Sisters (and Brothers) of Charity, f. by Mother Teresa. MAJOR PROTESTANT DENOMINATIONS & NON-DENOMINATIONAL GROUPS: Lutherans; Anglicans/Episcopalians; Presbyterians; Reformed; Anabaptists; Baptists; Methodists; Quakers; Unitarians; Mennonites; Amish; 7th Day Adventists; Evangelicals; Holiness groups; Pentecostalists; and neo-Pentecostalists.